To be clear, this blog is not “famed”! Also, stratechery launched on March 25. It’s interesting how some folks are always looking for some sort of institutional authority.1 I’ve been quoted as “Microsoft’s Ben Thompson,” as “former Apple intern Ben Thompson,” and “batshit crazy Ben Thompson.” I actually wish the third were true, because, unlike the first two, the descriptor rests on what I write, not on some sort of vague authority derived from whoever is signing my paychecks. Besides, both workplace references are out-of-date: I was at Apple three years ago, and, as of July 1, I don’t work for Microsoft either. 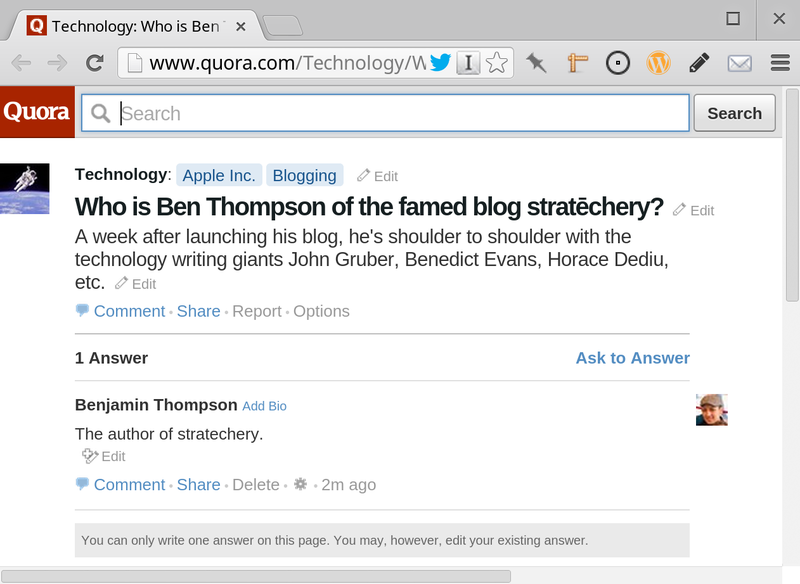 Instead, I am the author of Stratechery. What more is there to say? I’m a person, I put myself out there on this blog, and I trust that what I write represents me well. One of the many transformative aspects of the Internet is how it empowers individuals to build their own institutions. In days gone by, my thoughts would have been confined to myself and a few close friends; now my friends are all over the world, and I communicate with them through an institution of my own making. And yet, that sentence is oh-so-presumptuous. This blog has benefited hugely from a few key links and endorsements I’ve received to date,2 and on the technical side, the idea that I built Stratechery is ridiculous. Like millions of other writers who have built something on the Internet, the tool that made it possible is WordPress. And so, as I continue to build out my place on the web on a blog built on WordPress, I couldn’t be more excited about actually working for Automattic and Matt Mullenweg, the creator of WordPress. I start the end of the month. This is great news for this blog; WordPress’s original purpose was to be an elegant, well-architectured personal publishing system; the idea I speak for Automattic or that I derive any sort of “authority” from my employment is ridiculous, hopefully obviously so. What that means for Stratechery is my full, unfettered opinions about all companies and all topics.3 I expect my work to stand on its own, and I hope to be known simply as the author of stratechery. One final piece of news: I just said I have friends all over the world – those aren’t just Internet friends. I previously lived for six years in Taiwan, my wife is from here, and we’ve decided to move back. In fact, we arrived this morning, July 4. I’m taking advantage of the fact that Automattic is a company that truly lives its commitment to the web: it exists completely on the Internet, and its employees live all over the world. You may have noticed a slightly fewer number of posts over the last few weeks; blame packing and the logistics of wrapping up one’s life in one country, and preparing for life in another. I expect the slower pace to continue for at least the next couple of weeks.